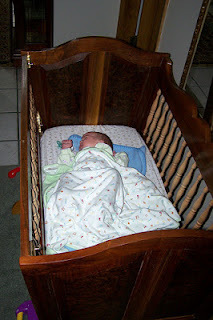 I spent a fair bit of time recently repairing a cradle that I had built some thirty years ago for firstborn Noa to sleep in. In the wee hours of morning, I completed it just in time for her arrival. So too, for the first months of their lives, Yossi and Tzvia, each in turn, slept in the cradle. Made of New England fir and oversized oak rockers, to more easily set it in motion, the cradle broke during one of many moves over the years. The curved top at one end cracked and swayed back and forth to the touch like a loose tooth. I knew that in order to repair it properly I would need to break the top off completely. I was unnerved by that thought, and the cradle remained in a forlorn state in the cellar. It is now repaired, as strong as it ever had been, ready for its second generation of occupants. As I had completed its building just in time for the arrival of his mother, I completed its repairs just in time for the arrival in Boston of firstborn grandchild, Leo. Marking the week of Leo’s first visit to Boston, the Torah portion Pinchas (Numbers 25:10-30:1), speaks to me in a very personal way. It is the Bas Mitzvah Torah portion of my youngest daughter, Tzvia. The most important verse to me in this portion is the first verse of chapter twenty-seven, And the daughters of Tzelophchad…, of the families of Menashe, the son of Yosef, drew near – and these are the names of his daughters: Machlah, Noa, and Choglah, and Milkah, and Tirtzah. In a single verse is the name of Yossi and Noa. Each is present in the story of the other, their little sister singing the song that joins them all. The story itself is one of triumph and transformation, of an injustice made right. Upon their father’s death, the daughters of Tzelophchad petitioned Moses for the right to inherit. Brought before God, the merit of their claim is acknowledged and the legacy that is passed through the generations is passed for the first time to daughters. However incomplete as it unfolds through time, the repair brought by the daughters of Tzelophchad offers hope in the face of the great violence from which the portion unfolds. They represent the possibility of change and the courage to strive. Juxtaposed with violence, their witness reminds that here too it is for us to claim what is ours, an inheritance of peace. Beyond generations of what has been, there glistens the promise of what can be. Of sisters drawing near and standing together, they remind us all that we each have a place that is our due. Sisters and brothers joined in one verse, Noa and Yosef, the Bas Mitzvah portion of Tzvia, a song of all children, of generations and inheritance, of time unfolding. As I placed little Leo into the cradle for the first time, my heart swelled, lifeblood flowing from generation to generation, time held still in a single teardrop. Dreams of long ago infusing the wood, dreams of tomorrow forming, the cradle is my prayer for every child to receive her or his due, to sleep unafraid in a world made whole. Leo smiled up at me as I gently rocked him, the cradle was his now, repaired and renewed.